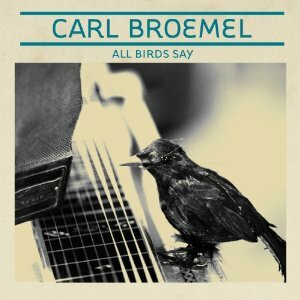 Somewhere in between playing with My Morning Jacket and appearing on albums by folks like Karen Elson, Bobby Bare, Jr. and Cory Chisel, multi-instrumentalist Carl Broemel actually found time to record a solo album. All Birds Say is a mellow collection of alt-country songs that are deeply layered and subtly delivered. Weighty thoughts and complex musical interplay are thinly veiled beneath the unassuming strum of Carl’s guitar and his laid back delivery. His songs are full of lyrical and musical gems to discover if you want to dig in a little, but he’s not concerned with demanding your attention. All Birds Say is the aural equivalent of gently swaying in a hammock between a philosopher and composer and the choice between engaging or just enjoying is fully yours. Among the 11 tracks on All Birds Say, Carl is credited with playing guitar, pedal steel, bass, dobro, violin, autoharp, baritone sax, percussion and bells. If that’s not enough orchestration for you, he also had some friends come in to play clarinet, basso buffo organ, synthesizer, piano, vibes, trombone and drums. The diversity of the instruments is only matched by the skill with which they are played. There’s a lot going on in the way of musical theory, chord structure and melody but it all comes across smoothly and unpretentiously. The lyrics take the same hidden treasure approach. Some of my favorite lines are, “Let’s not wait around for death to show us how well we have lived, this life leftover is all we get” from “Life Leftover,” “Don’t get carried away in the past, it’s not there” from “Carried Away” and “It takes a lot of time to know your mind, save an hour for yourself” from “Questions.” He’s not above self-criticism and introspection though. In the song “On the Case,” the verses are used to relate the human struggle of getting caught up in yourself enough to miss the important things, while the chorus reminds you that the way you have done things in the past doesn’t have to be the way you do them in the future. All Birds Say is a great album to put on to relax, but be warned, it will eventually inspire thought and conversation before you know it. Carl manages to convey great truth and inspiration without grandstanding. It’s a message without a soapbox, something we could all use more of.